The skin is made up, among other things, of tiny openings called pores through which sweat and oils are secreted. In addition to keeping the skin supple, the oils, known as sebum, prevent it from drying out and protect it against certain bacteria. Acne occurs when pores become clogged with excess sebum and dead skin. This leads to an overgrowth of the bacteria that normally live on the skin, causing inflammation and the formation of pimples. 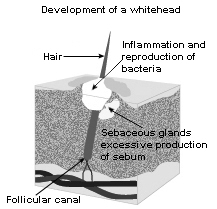 The appearance of lesions varies, and is based on the overall severity of the acne. In more mild cases, only a few blackheads, called comedones, are present. In more severe cases, small nodules (cysts) may form under the skin. These cysts are painful and can lead to permanent scarring. TRUE - It is estimated that acne affects between 80 and 90% of teenagers. It affects more boys than girls. During puberty, the body undergoes many changes including a surge in hormone production. This promotes sebum production which in turn causes acne. Acne tends to resolve between the ages of 20 and 40. It can, however, persist into or develop for the first time during adulthood. Post-adolescent acne predominantly affects women. Some experience breakouts a few days before the start of their menstrual period as a result of hormonal changes. Newborns can also suffer from acne which usually disappears spontaneously. Poor hygiene causes acne so it is important to wash your face often to prevent outbreaks. FALSE - Although washing helps remove dirt that can clog pores, it is important not to irritate the skin. Over-washing your face or scrubbing too hard can worsen your acne. Instead, it is recommended that you gently wash the areas in question twice a day with a mild, fragrance-free soap or cleanser. Dove® soap or soap substitutes such as Spectro Jel® and Cetaphil® are suitable options. Your healthcare provider can advise you. It is recommended that you apply the product with your fingertips and thoroughly rinse your face with warm water (avoid hot water). Acne is caused by poor eating habits. FALSE - No direct link has been established between diet and acne. Generally speaking, diet is not considered a main cause of acne. There is no evidence to show that dairy products, chocolate or high-fat foods increase the risk of acne. It is important however, for everyone, regardless of whether or not they have acne, to eat a balanced diet that is low in sugar and saturated fat. TRUE and FALSE - Stress has not been conclusively shown to cause acne. Intense psychological and emotional stress however, may aggravate acne. Can I take any preventive measures? Although acne cannot be prevented, there are some measures you can take to help control outbreaks. Washing your skin with soap and water is key. It is also important that you refrain from touching or squeezing your pimples. This may simply worsen the acne and cause scarring. Oil-based cosmetics should also be avoided. Instead, use non-comedogenic, water-based products. The sun appears to improve mild acne lesions but in some cases, may also worsen them. Also, many of the products used to treat acne make the skin more sensitive to the sun. Prolonged sun exposure should be avoided and the use of a non-comedogenic sunscreen is recommended. Are there treatments available to help me manage my acne? Several medications are used to treat acne. They can be used alone or in combination with other products. Selected medication is based on the type of lesion, the severity of the acne and individual tolerance. Product formulation (gel, cream, lotion) is based on skin type (normal, dry or oily) and patient preference. Gels are usually recommended for patients with oily skin because of their drying effect, while creams and lotions, which have a hydrating effect, are usually recommended for patients with dry skin. Some products, such as benzoyl peroxide, which is commonly used to treat mild acne, are available without a prescription. Recent scientific data however, suggests that some products available by prescription only, are better treatment options for some patients. There are many other treatment options available with or without a prescription depending on the severity of the acne. These include topical and oral antibiotics. Speak to your healthcare provider for more information. The vitamin A derivative isotretinoin (Accutane®) is used to treat severe cases of nodular acne. This drug must not, under any circumstance, be taken by women who are pregnant. It has been shown to cause very serious birth defects. All women must have two mandatory pregnancy tests before starting treatment. They must also use two effective methods of contraception at least one month before starting treatment, during treatment and for at least one month after completing treatment. Several adverse effects are associated with this medication. Your pharmacist will be able to advise you on how to minimize or relieve these adverse effects. Acne is a common condition that can be managed through simple preventive measures and appropriate treatment. Early treatment helps reduce the long-term risk of scarring. Be patient and persevere because it may take a few weeks before you actually start to see any benefits from treatment. Acne may even worsen after treatment is started. Speak to your healthcare provider to choose a treatment that is right for you.